How do you talk about important issues without being rude and boorish? That was the challenge a lawyers group sought to overcome, and its initial effort was on display last night, Thursday, April 28. And for this visitor, it was a qualified success. The first notice I received in late March about the event looked to be in a debate format. It appeared to be two lawyers on one side of the topic “vs.” two others on the other side. That may have been more accurate, as the event was characterized more by mini-speeches than by sharp, concise, back-and-forth. That is not a critique, merely a recognition that the Society is feeling its way toward the ideal format for this original idea. Those mini-speeches ranged from well stated and clear to meandering and obscure, which is par for the course for any educational panel. But more than once, audience members may have wondered about the Series’ underlying premise: Do members of the public really want to hear from lawyers—on any topic—for two hours? Wisely, organizers did not put that question to a vote. Given the preparation and effort involved, organizers had to be disappointed in the modest turnout. 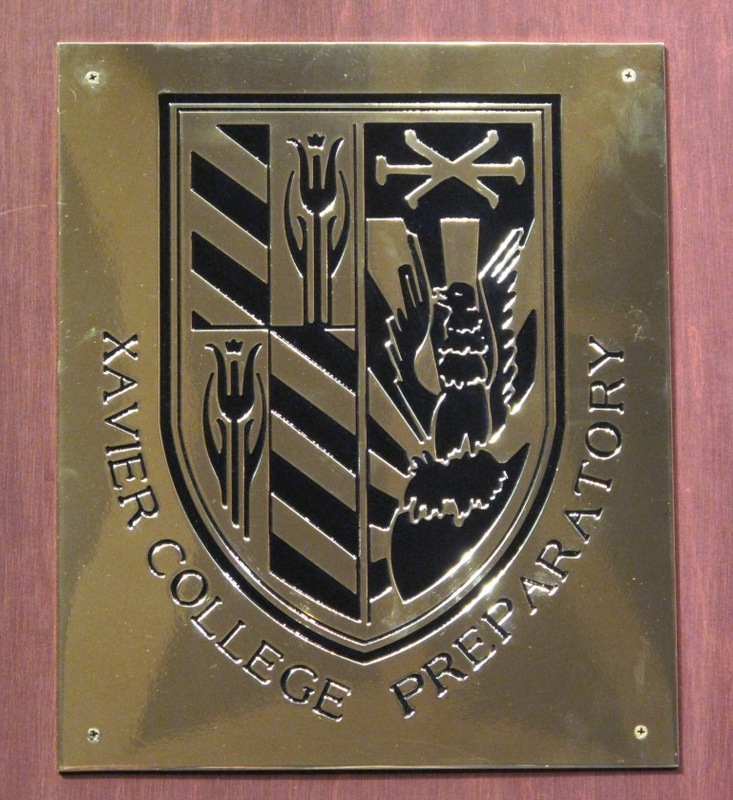 The venue was the Phoenix auditorium of Xavier College Preparatory. That is a beautiful and stunning room. But it’s also a very large room, which was only dotted with attendees. Certainly, marketing and communication will be a stronger focus for Volume 2 of the Series (which will be on immigration, co-chair Denise Blommel revealed). These are just quibbles. 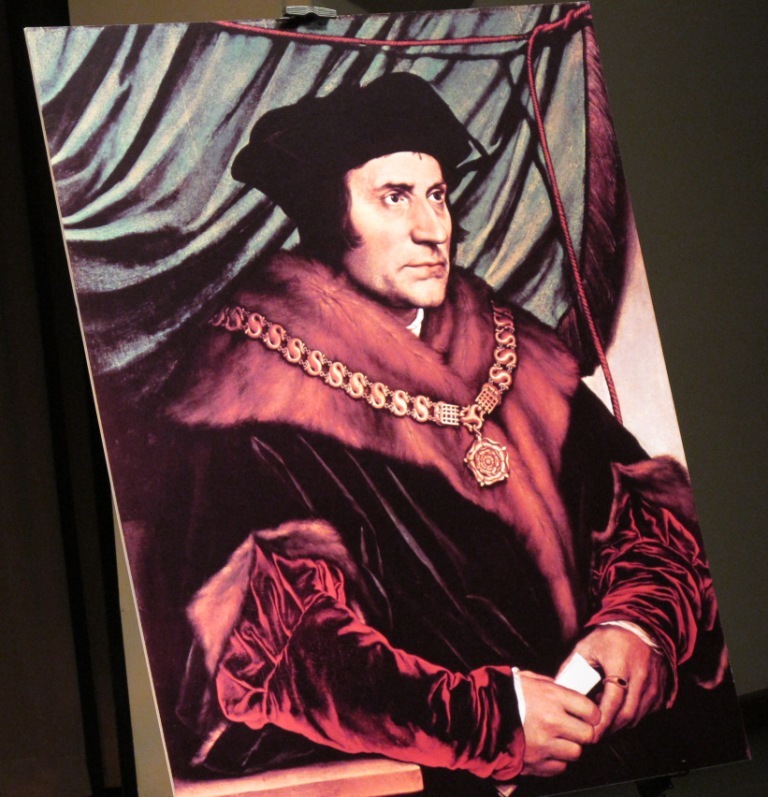 In a state that is only 110 days beyond a horrific assassination attempt in Tucson, praise must be given to the St. Thomas More Society, which is addressing head-on a coarsening of the national debate that dismays most everyone (though not everyone). Unlike the rest of us, though, the Society is doing something about it. The evening’s moderator was Ernest Calderón. His resume is long, but the short form is that he is a Regent on the Arizona Board of Regents, a former President of the State Bar of Arizona, and a practicing lawyer. Ernie was a good choice for the role. He is capable of a great amount of gravitas when it’s called for. But he graciously set that aside last night, as he sought to cajole, persuade, kid and prod panelists into uttering real and compelling statements on a difficult topic. Clearly, he came prepared to herd the speakers away from the raft of arguments on both sides that the public has heard for years, and toward some out-of-the-box analyses. He was moderately successful. The panelists were cautiously open to addressing Ernie’s deliberately provocative hypotheticals. That was when the evening soared. But there were more times when panelists got lawyerly, challenged the assumptions underlying a question, and negotiated terms to lower a question’s stakes. Unfortunately, that led to less illumination than would have been ideal. Nonetheless, it is still invigorating to see smart people bat contrary ideas back and forth. Attendees were probably unsurprised by the arguments: retired Judge Rudy Gerber on one side reminding us that our use of the death penalty puts the United States in the company of China, Iran, Iraq, Saudi Arabia and Yemen; and Tom Horne on the other side reading at (overly sufficient) length from the trial record of horrific details that occurred in notorious torture–homicides. Although the two positions may not be new, they were gripping nonetheless. A moment of pointed debate occurred when panelist Alan Tavassoli challenged Tom Horne’s repeated statement that Horne was on the side of justice for victims, which equaled capital punishment as a solution. The AG had reiterated the “Justice = Death Penalty” trope throughout the evening, and Tavassoli finally observed that all the panelists were on the side of justice, which he believed life without the possibility of parole may provide. His question to Tom Horne could have led to an interesting exchange. Unfortunately, that was just moments before the event ended. More photos of the event are at the Arizona Attorney Magazine Facebook page. I’ll provide more detail on the fall version of the Series as it comes available. There are a lot of ways to celebrate the contributions of women to human history. 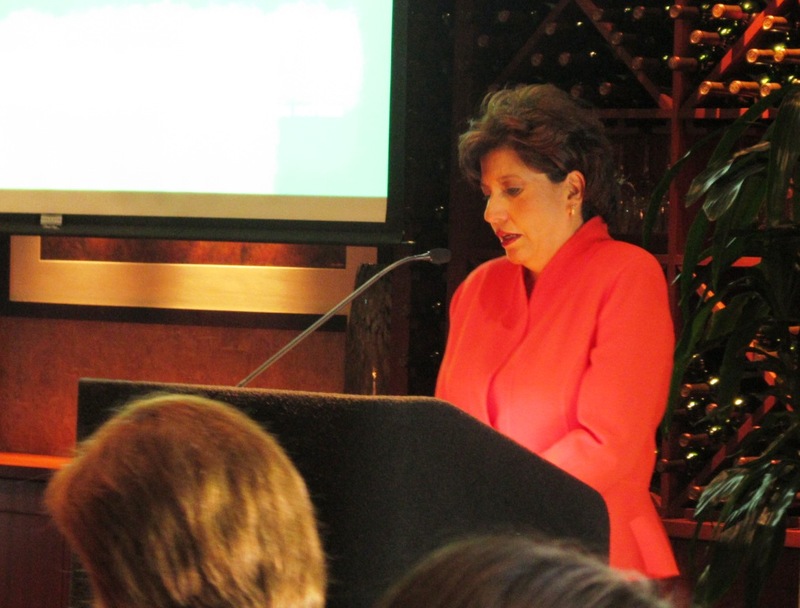 And “the women of DLA Piper” (their description) opted to gather people together yesterday to hear from Judge Mary Murguia, newly elevated to the U.S. Court of Appeals for the Ninth Circuit. When she took the bench in 2000, Judge Murguia was the first Latina to serve as a federal Judge in the District of Arizona. And her legal career has spanned a period as an experienced prosecutor at the state and federal level, as well as time as an administrator at the Executive Office for U.S. Attorneys. The judge’s remarks were focused on the occasion of Women’s History Month, and her compelling life story was an appropriate subject for such an occasion. She recalled that, as a new assistant district attorney in Kansas City in the mid-1980s, she and the two other women lawyers were assigned all of the sexual abuse and domestic-violence cases (along with many other cases). But the gender biases of the times provided a surprising benefit, she said: Those cases, unlike many others, were more likely to go to trial. And the challenges that they carried in poor or missing physical evidence and witness problems made her and the other women lawyers work harder to become excellent trial lawyers. Through her career, she also had the chance to work on the Timothy McVeigh case and other high-profile matters. Judge Murguia recalled that when she and U.S. District Judge Susan Bolton both took the federal bench, they immediately tripled the number of women trial judges in the U.S. district (joining longtime Judge Roslyn Silver). Many may recall where they were when John F. Kennedy was shot, she said (she was only 1 at the time). But different mileposts mark her life. She said she remembers where she was when Geraldine Ferraro was nominated as vice president to a major party ticket. And she can picture when the name of Sandra Day O’Connor was forwarded as a Supreme Court nominee. Like many successful lawyers, the Judge credits her family with her achievements. Her Mexican American parents worked long and hard for their seven children. Today, six of the seven have post-graduate degrees. And four of them are lawyers. Judge Murguia laughed as she remembered overhearing her mother and godmother talking about her and her twin sister Janet (then working in the White House and today the President and CEO of the National Council of La Raza). Representing the DLA Piper law firm were litigation associate Laura Kam and partner Cynthia Ricketts, who introduced Judge Murguia. Congratulations to them and all the women who put together such a great program. Some event photos are at the Arizona Attorney Magazine Facebook page. 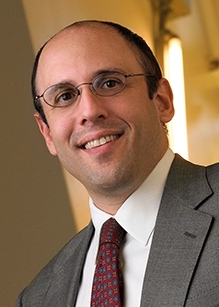 This afternoon, I received a press release indicating the Paul Schiff Berman has accepted a position as Dean at the George Washington University Law School. The release came to me from GWU. I confirmed the fact of his departure with the ASU Sandra Day O’Connor College of Law, but no additional substance on the matter is forthcoming from them yet. This sounds like they too are playing catch-up. I will pass on word as ASU Law School gins up the Dean Search Engine once again. Just last month, I took a moment to wish Dan McAuliffe a happy birthday. Though he passed away a year ago, he is still on the minds of many in the Arizona legal community. That was clear yesterday, as a remarkable CLE commemorated his life—and his love for the intersection of media and ethics. Throughout the morning, a packed audience sat in the State Bar of Arizona CLE Center—named in honor of McAuliffe—and watched selections of the man’s favorite legal movies and TV shows. All of the clips were taken from his own collection, some of which, the moderator told us, appear to have been videotaped with a handheld device while the TV broadcast a show. Peppered among the clips, of course, was discussion about what was professional or, more likely, unprofessional, in the clips. Panelists were selected for their knowledge of ethics and of Dan. “Dan made ethics accessible to people by making it fun,” Larry added. Also on the panel were lawyers Lynda Shely, Ed Novak and Jim Lee. 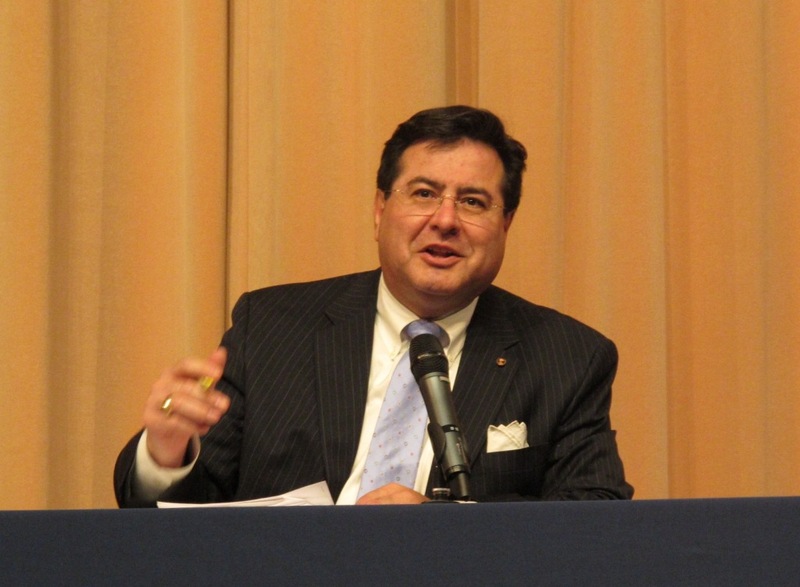 It was moderated by the State Bar’s Ethics Counsel, Pat Sallen. Each was adept at seasoning their ethical lessons with stories of Dan and his influence on the profession. 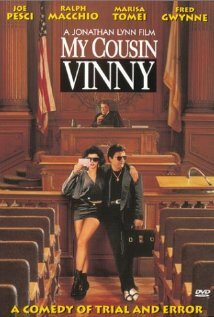 The event opened with clips from McAuliffe’s favorite lawyer movie: “My Cousin Vinny.” As Dan’s widow Shirley Wahl McAuliffe said, “Any movie that can take a pro hac vice application and turn it into a running joke” would earn Dan McAuliffe’s love. If you haven’t seen it, get out there and rent it. But until then, enjoy this clip from a courtroom scene. Q: How do you get a mess of criminal-defense attorneys to call the Governor’s Office to advocate for stiffer sentences? A: Advance a bill to her desk that pairs a reduction in penalties for DUI with a provision that largely eliminates the ability of a defendant to get a jury trial in DUI cases. 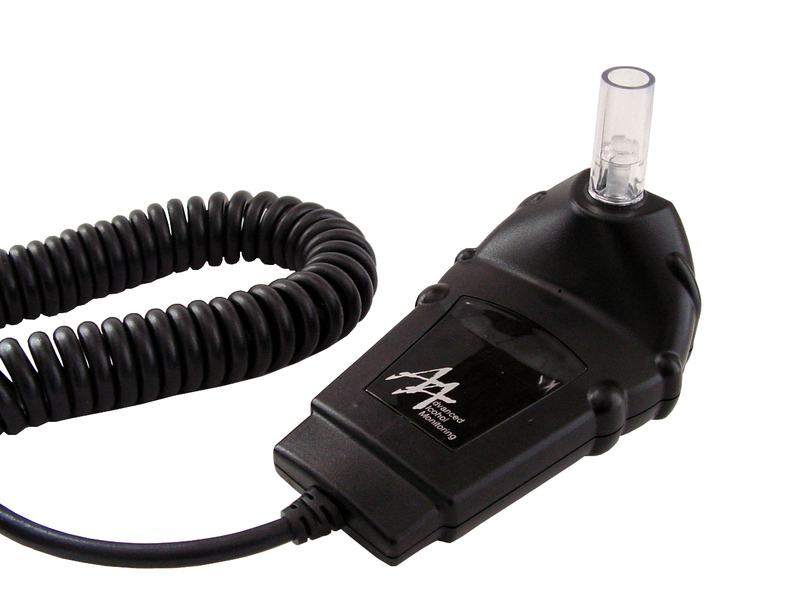 As the AP’s Paul Davenport reports here, it is unclear why the no-jury provision was added to the bill that was designed to reduce the amount of time a convicted person must use an ignition-interlock device. Given the history of the original bill, though—written solely as a means to head off an even more defendant-friendly bill that would have reduced the interlock time even more drastically—it may just be a way to make defense lawyers pay a foot for the inch they had achieved. But the ones I’ve spoken with have said the loss of jury trial is too great a price to pay for what they say was a reasonable interlock bill. Because they did not just fall off the turnip truck, though, they tell me that they understand the chilly reception they would receive if a mass of them called the Governor’s Office urging a veto because their clients’ jury-trial right is sacrosanct. Instead, they are urging her to veto because criminal sentences should remain stiff in Arizona. Can Conflict-of-Interest Laws Squelch Free Speech? Here in Arizona, we are used to strange interactions between ethics and politics (yes, dear reader, they do intersect). But when we feel we may have things somewhat well in hand, all we need to do is gaze northwest, where the State of Nevada reminds us that all is odd in the universe. The question posed in the latest Silver State brouhaha: Whether an elected official’s vote is an exercise of free speech. 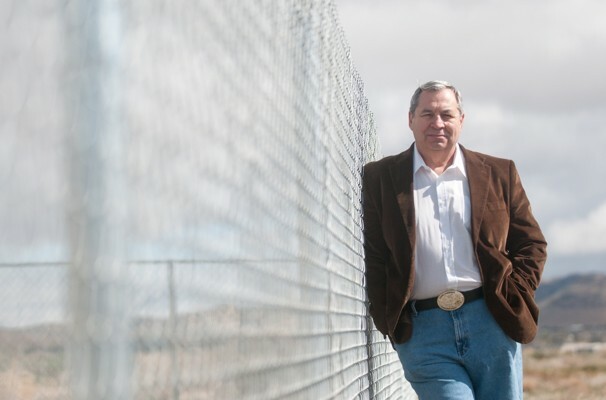 “I have the distinction of being the only elected official in Nevada to ever be brought up on ethics charges for losing a vote,” Carrigan said. For more information on the Supreme Court case (Nevada Commission on Ethics v. Carrigan, Docket No. 10-568), click here. Modern large-firm law practice has thrown a variety of challenges toward firms that want to excel and grow. One of the tools those firms use to grow their business and their market-share is networking—often on a global scale. Organizations like Lex Mundi and Mackrell International allow and encourage interaction among lawyers globally. They also provide a great way to send legal work to lawyers in a score of localities. Recently, those two groups have seen Arizona—Phoenix in particular—as a great spot to meet and re-energize. In late March, Lex Mundi, in collaboration with the Association of Corporate Counsel, held a two-day event in and around Snell & Wilmer. Lex Mundi calls itself “the world’s leading association of independent law firms,” and Snell partner Barb Dawson is chair of its board of directors. More information on the conference is here. 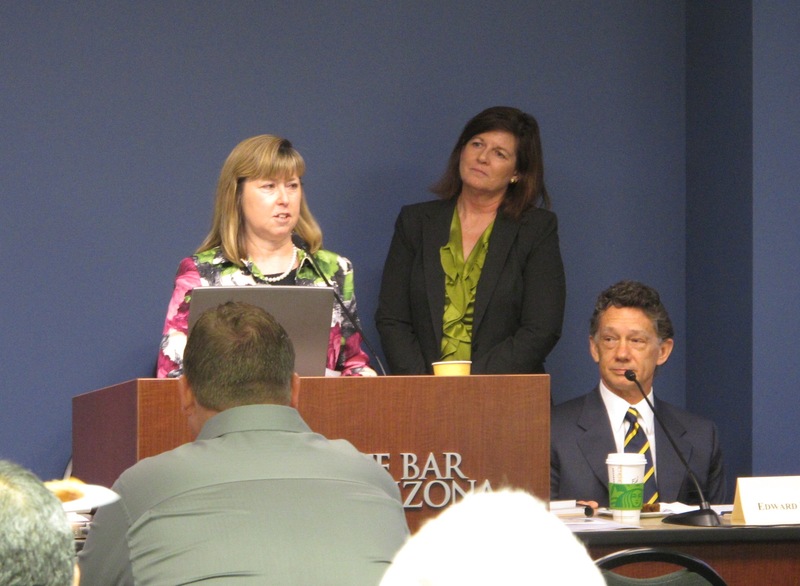 And go here for some photos from the conference, posted on the Arizona Attorney Magazine Facebook page. Hosted by Polsinelli Shughart (whose own Marty Harper is chair of the international network), the April-27-30 event will be held at the Arizona Biltmore. More information on this week’s Mackrell event is here. And a press release from Polsinelli is below. When United States companies explore business opportunities beyond our borders, the need arises often for legal services abroad. An international conference, held in Phoenix, will explore cross-border relationships to help attorneys better serve the business community globally. More than 100 attorneys from Africa, the Asia Pacific Region, Europe, North America, the Middle East, and South America will be in Phoenix to attend the 2011 Mackrell International Annual General Meeting (AGM). In recent years, the AGM has previously been held in Sydney, Athens, Berlin, Istanbul, and Buenos Aires. This is the first time the AGM will be held in the in the United States in 12 years. The event will be held at the Arizona Biltmore from April 27 – April 30. Polsinelli Shughart PC Shareholder Marty Harper, from the Phoenix office, is the chair of this international network of law firms that takes a “common sense” approach to conducting business internationally. Mayor Phil Gordon will welcome the international visitors, and discuss foreign investment opportunities in Phoenix and upward economic trends occurring in the Valley. The mayor will speak April 29 from 12:30 p.m. to 1:30 pm. In addition to Mayor Gordon, Polsinelli Shughart welcomes Dr. Angel Cabrera, president of Thunderbird Global School of Management. Dr. Cabrera will address trends in both the local and international economy, as well as discuss the legal issues impacting their specific regions and the potential for doing business in Arizona. His keynote address is April 28 from 12:30 p.m. to 1:30 pm. In addition to Harper’s role as chair of Mackrell, Polsinelli Shughart has a growing international law practice to serve clients in Phoenix. The attorneys focus on high-profile litigation and complex business matters in a variety of practice areas and industries. Attorneys who have previously served as in-house counsel for national and international companies bring a unique perspective to several practice areas. Mackrell International, with 80 law firm members in 55 countries, brings together over 4,000 lawyers from independent law firms through its various actions. The AGM is the culmination of the work that happens globally all year. Note to editors: Media interested in attending should contact Molly Edwards at medwards@polsinelli.com or via phone at 602.650-2338. With more than 530 attorneys, Polsinelli Shughart PC (www.polsinelli.com) is a national law firm that is a recognized leader in the areas of business law, financial services, real estate and business litigation. Serving corporate, institutional and individual clients, Polsinelli Shughart is redefining the business of law by sharing ideas, goals and outcomes with its clients. The firm builds enduring relationships by creating value through legal services – with passion, ingenuity and a sense of urgency. The firm has offices located in Kansas City; St. Louis; Phoenix; Chicago; Denver; Washington, D.C.; New York; Wilmington, Del. ; Overland Park, Kan.; St. Joseph, Springfield, and Jefferson City, Mo. ; Topeka, Kan.; and Edwardsville, Ill.
Mackrell International (www.mackrell.net) is one of the world’s premier networks of independent legal firms. Membership enables our members to provide their clients with legal services at home and abroad. With member firms in 51 countries, Mackrell International gives clients access to 4,000 lawyers worldwide providing a seamless legal service wherever the client needs it. The organization has increased its representation by 35% in the last three years by adding new firms to our network, particularly in Eastern Europe and in both North and South America. Expansion continues in the Middle East – Israel and Dubai are now on board – and representation is growing in other key areas of the world, such as Africa and Central America.